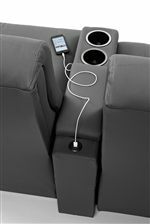 The Costilla Contemporary Power Space Saver Reclining Console Loveseat with Power Tilt Headrests and USB Charging Ports by Best Home Furnishings at Best Home Furnishings in the St. Louis, Chesterfield, St. Charles, MO & Waterloo, Belleville, Edwardsville, IL area. Product availability may vary. Contact us for the most current availability on this product.